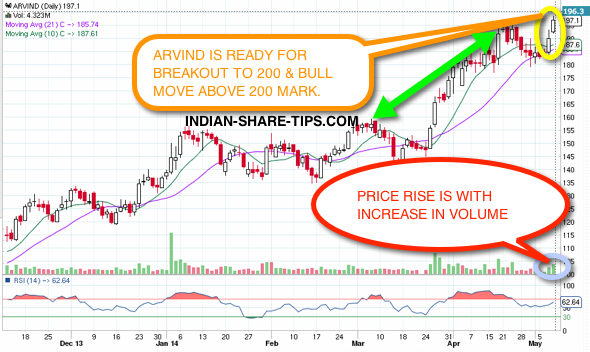 Arvind is a stock which has got a clear chart and is showing the long term bullish trend. As we can see that stock is within a rising trend and we see a lot of movement as soon as stock crosses 200 mark with volume. As a trading strategy, one can be long in the stock and once it crosses 200 mark, then shift the sell order to 200 level. Deep stop loss for stock can be at the level of 151 which is its strongest support. Why, we are bullish as stock has crossed its 21 day moving average price and is showing bullishness on commodity channel index and momentum. However remember that unless stock moves above 200 mark this figure is going to be tough resistance. Analysis of the volume suggest that tops and volume bottoms are corresponding well with tops and bottoms in the price. Thus we see stock in bullish trend. Our clients are long in the stock and we suggest you to check our delivery tips and make money like professionals and if day trading is your forte then none can beat the intraday trading tips which gets you profit in 2 hours. Are you Ready?